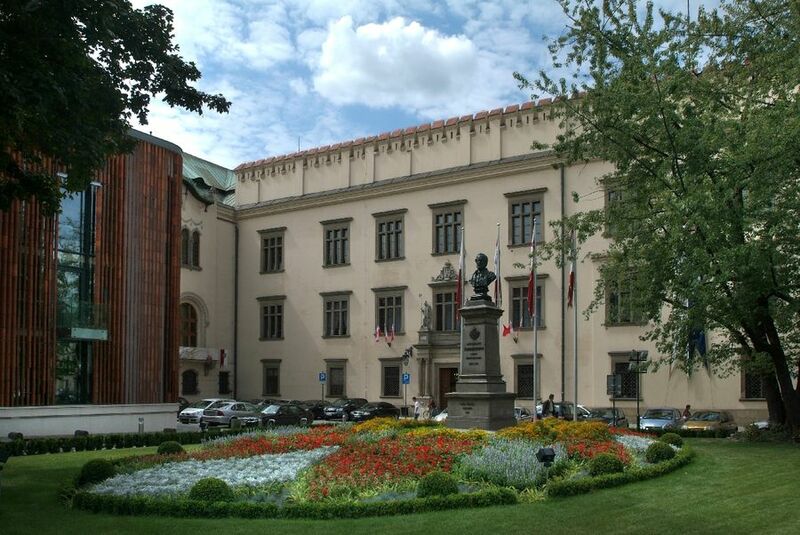 A representative building at the All Saints Square has been the headquarters of the authorities of the city of Krakow since 1864. 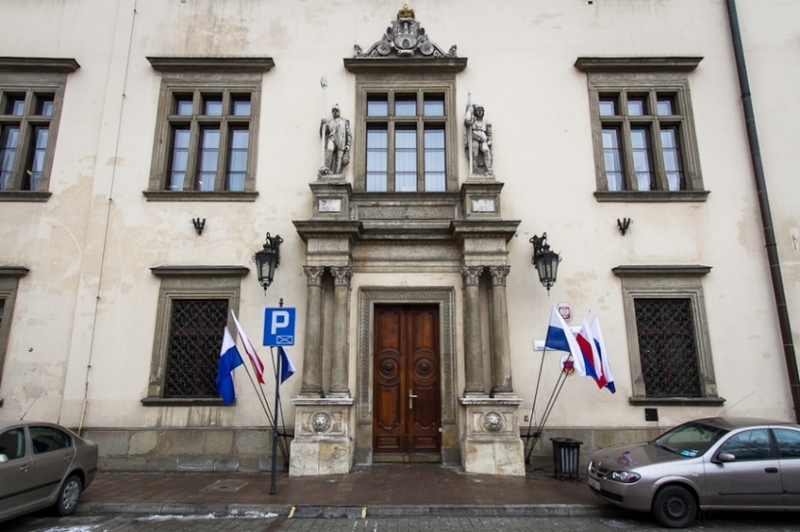 The building traditionally called Wielopolski Palace was built in the mid-16th century and is an example of Renaissance town palace. It was erected for the Grand Crown Hetman, Jan Tarnowski. The palace had characteristic, unique shape, a part of which has survived to this day in the east wing of the building. It was topped with Renaissance, extraordinarily high attic. Since the mid-17th century to the mid-19th century, the building remained in hands of Wielopolski family. They ordered remodeling of the palace, of which a ceremonial hall, staircase, vaults and stone portals are preserved until today. Wielopolski family made representative rooms on the ground floor available for various societal and public purposes. The best years of the Wielopolski Palace ended abruptly with the great fire of 1850. Like most of the buildings around the current site of All Saints Square, the palace was consumed by the fire. The owners decided to sell it and for some time the building housed an elegant café. Also, masquerade balls and musical evenings were organised in the palace. Some rooms served as artists’ studios. In 1864, the building was purchased by the municipal authorities as their headquarters. In subsequent years, a series of restorations were carried out in order to meet the needs of the town hall. The representative entrance was located on the side of All Saints Square, municipal and presidential offices were created on the ground floor and ballroom on the second floor was transformed into a meeting room. The room was decorated with busts of Polish monarchs. In the early years of the 20th century, the building was enlarged, expanded with outbuildings on the Poselska street. A big change in the interior followed the rebuilding after the fire of 1926. From around that time comes a new tradition of placing portraits of presidents in the hall outside of the office of the current president. These portraits, painted by prominent artists – including Wojciech Kossak, Theodore Axentowicz, Alfons Karpinski, are now precious objects of great historical and artistic value. It is not known when exactly this story happened, but it was told for the first time in 1895 by the anonymous author. The story shows a venerable priest, summoned in the middle of the night for confession. A carriage was sent for him, in which there was also another man. When they reached the palace, they were invited to a room and a moment later came an old man, who brought a girl with him. It was beautiful, dressed in black daughter of count Wielopolski, all in tears. The young woman confessed to the priest. Then, it became clear, who the second man was. He turned out to be the executioner and the girl was beheaded immediately after the confession. The priest and the executioner were offered some wine to soothe nervous atmosphere. Priest’s hands were shaking so that he poured the wine on himself. Later, men were escorted to the carriage. When the priest came back to his house, he felt that his skin burnt. He knew that nerves had saved him from death because the wine must have been poisoned. It is said that the daughter of count Wielopolski engaged in a love affair with a servant. The family punished the girl that disgraced the family name. The story long circulated as an urban legend, a cautionary for women seeking romance. It was said that the White Lady haunts the building. When in 1903, the City Council decided to install central heating in its premises, a ghastly discovery was made. Workers working in the basement found human bones bricked up in the wall. Studies confirmed unequivocally that it was the skeleton of a young woman.